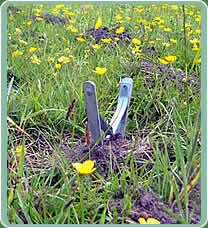 APMC Affiliated suppliers of mole traps and other equipment for mole catchers. Industrially manufactured mole traps form the physical backbone of modern mole catching practice, the availability of traps that are of good quality design and manufacture being fundamental to the pursuance of good practice. Any mole trap that is deployed to kill on capture, i.e. with the purpose of delivering predictably and efficiently a fatal action, should be capable of performing reliably and consistently. All modern mole 'kill' traps in common use are mechanical spring traps that rely on delivering effectively the stored energy released by a spring under tension to catch the mole. Any spring powered mole 'kill' trap should therefore have the capacity to deliver predictably an impact force capable of delivering appropriately a fatal injury.